A year or so ago when we were sorting out the loft Mr Boo came across a box full of his old toys from his childhood. He brought it down and showed Roo and Tigger all the different figures etc. that he had once played with. Within that box was a collection of Teenage Mutant Ninja Turtles which caught the eye of Tigger and has loved playing with them ever since. Recently Tigger was sent two figures from the new Half Shell Heroes range. This is the range specially designed for younger TMNT fans with a Dino and Turtle theme to the range. You can join the fun-loving brothers in their pizza-fuelled missions as they team up to mess with menacing mutants and stop the Shredder. But this time, the Turtles have been sent back in time to the prehistoric age, where they encounter Dinosaurs! The Turtles need to work together to find a way back to present day New York. The Turtles have trained some Dinosaurs to be on Team Green. 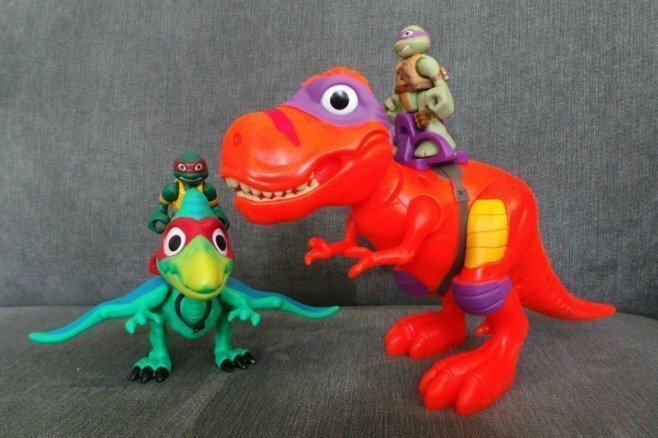 The T-Rex and Donnie playset complete with an exclusive Donnie figure and T-Rex that sweeps up enemies with his moveable jaw and arms. Pressing down on his head will open his jaw and make the T-Rex appear to roar at his enemies. Pressing down on his head will open his jaw and make the T-Rex appear to roar at his enemies. Colour coordinated with Donnie the T-Rex sports a purple eye mask and knee pads. 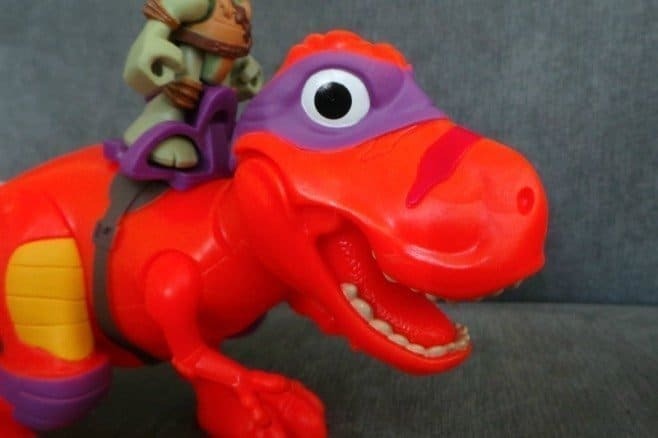 Donnie is held in place on the back of the T-Rex by a purple standing platform which holds Donnie securely whilst your little one stomps the T-Rex on the floor chasing after the baddies. 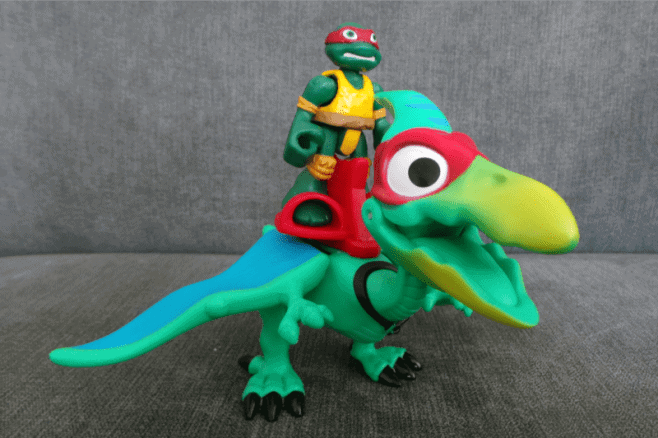 The Pterodactyl and Raph playset complete with an exclusive Raph figure and Pterodactyl that flaps his wings by pressing the button on his back. With a movable jaw, your little one can decide whether or not to have the Pterodactyl appear as if it were screeching as it moves through the air looking for the Turtles enemies. 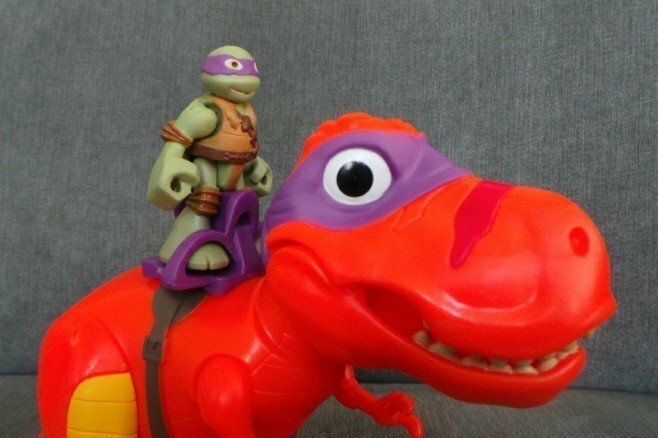 Complete with a mini Raph figure the Pterodactyl coordinates with him wearing his red eye bandana. As soon as I unpacked these from the delivery box Tigger was jumping up and down wanting to play with them immediately. With the eagerly released from their packaging, Tigger was dashing around the room flying the Pterodactyl through the air flapping it’s wings and dive bombing to the ground. The T-Rex stomped on the floor in search of ‘bad guys’. The Half Shell Heroes are made from a durable plastic that feels as though they are built to last and ready to take the rough and tumble of a 5-year-old boy. The playsets are available from Amazon and all other good toy retailers, with the Pterodactyl and Raph set priced at £16.99 and the T-Rex and Donnie set priced at £19.99.